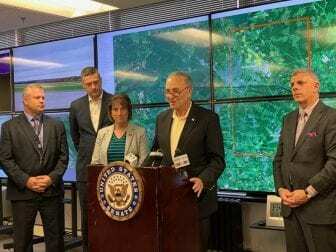 SYRACUSE, NY (WRVO) – Boosters of drone technology in central New York are hoping the federal government comes through with some new research dollars in the coming months. When lawmakers go back to Washington for a lame duck session, they are expected to approve a first-ever funding stream earmarked for research into unmanned aircraft systems. That would place $6 million up for grabs to the nation’s seven Federal Aviation Administration-designated Unmanned Aircraft Systems test sites, including the one at Griffiss International in Rome. Lawmakers are promising they will get as much as they can of that pot of money for central New York. Rob Simpson, president of CenterState CEO, says it would be welcomed because, with much of the drone technology in place, the next step is innovation. Simpson said there are applications on a number of fronts, including agriculture and law enforcement. And he said innovation is happening at such a fast clip right now, the idea of using quad copters for moving people in airborne taxis is a possibility in just a couple of years. Congress is expected to take up this funding as part of the so-called THUD, or Transportation and Housing and Urban Development bill, at the end of the year.